I am a sucker for really good, ooey gooey chocolate chip cookies. In my opinion, just forget the apple pie; there’s probably nothing that says “American” quite like chocolate chip cookies. Bill’s Chocolate Chip Cookies. Here the dough was refrigerated and they’re softer and thicker, but still just as chewy. This recipe for chocolate chip cookies is super easy and one of my faves. It has stood the test of time at my house. It’s actually the first “gourmet” chocolate chip cookie I ever made, passed on to me from an old friend when my son was just a baby…about 25 years ago! I think maybe Bill pulled the recipe from Gourmet or Bon Appetit but it’s been too many years to remember. These are big and buttery, lavish chocolate chip cookies positively loaded with chocolate chips! I like to use a mix of semi and milk chocolate – the best of both worlds, but they’re great with just one kind of chocolate or the other. I don’t use nuts, but you sure could – just keep in mind that the dough is so full of chocolate you could hardly put anything else in there and still have it hold together! And when I said these are big, cookies, I mean big. They really are a good sized cookie. If you want more cookies (and you probably will) you can easily double the recipe and it’s just fine. Bill’s Chocolate Chip Cookies. These were baked right away, and spread a bit more. Do you like thin & crispy, thin & chewy or thick & crispy or thick and chewy Chocolate Chip Cookies? There are really four ways these cookies can be baked, all with different results. If you bake Bill’s Chocolate Chip Cookies right away, they’ll spread to about 4 1/2 inches across and be a bit on the flatter side. You can choose to take them out when the edges are barely set and the center is soft and the chocolate chip cookies will be thinner and chewy. Leave them in longer and you’ll have a thin and crispy “classic” chocolate chip cookie. If you’re after a thicker cookie, refrigerate the dough and there won’t be as much spread but you’ll have more height. Again, bake them until the edges are set and the center is still soft and you’ll have thick cookies with an ooey, gooey almost creamy center. That’s my favorite way to bake these cookies. And while I like my chocolate chip cookies very soft and ooey, gooey, if you like a crispier cookie, although I don’t know why you would, lol, just bake them a little longer. They’re still amazing, and I wouldn’t turn one down, but I still vote for ooey, gooey. In order to get the rougher looking craggy tops, scoop your dough, roll it into a ball, but right before baking, pull the dough ball apart and put the rough side of the dough right on top of the other side. When you’re baking the thinner cookies I do recommend this, but if you’re baking the thicker cookies with the refrigerated dough, I highly recommend doing this. It really does make for a cookie that bakes up better. I stole that idea years ago from Cook’s Illustrated and it really does work. That way some of the chocolate chips are exposed during the baking process, while if they’re just rolled into balls, the chocolate chips tend to stay under the dough. Bill’s Chocolate Chip Cookies. If you like your cookies brown & crisp, just refrigerate the dough & bake them longer. These chocolate chip cookies use melted butter, which helps that chewiness, but it also means they are “stir together.” No creaming needed, no need to wait for room temperature butter and they can be mixed by hand, or if you’re lazy like me, with a mixer. Think how great that is if you’re someplace without a fully stocked kitchen; maybe you’re on a ski trip, at the cabin or just starting out in your first apartment. Just mix these up and look like a hero. The one drawback of this particular cookie? They’re just not as “pretty” as a bakery type chocolate chip cookie and they are so tender, they are almost a little soft. That’s ok with me; I’ll sacrifice taste over looks every time, but it’s a good thing to know. As far as shopping tips, with all this butter & chocolate, these are not the cheapest cookie to make! Watch for sales on the butter and freeze, and look for sales & coupons on the chocolate chips. Bill’s Chocolate Chip Cookies. Here the dough was refrigerated and they’re softer and thicker, but still just as chewy.. These are the best chocolate chip cookies, ever, and bonus, they’re made with melted butter so no need to wait for butter to soften! Make these cookies thin & chewy, refrigerate to make them thick & chewy, or just cook them longer for a crispy cookie. 18 ounces (1 1/2 packages) chocolate chips, semi-sweet or milk chocolate or a combination. Mix together melted butter with sugar. Add vanilla and eggs and mix well. In a second bowl, mix together flour, soda, and salt. Add to the butter-sugar mixture and stir together. Add chocolate chips and stir in. The dough will be soft. Using dough immediately, portion out in scant 1/3 cup measures, gently shape into a ball and place on cookie sheet with very generous spacing. The final cookies will be about 4 1/2 inches across. Optional but recommended: Take your balls of dough, tear in half and put 1/2 on top of the other, with the “torn” edge facing upward. Gently reshape the bottom portion back into a round shape if it has become misshapen. If soft chewy cookies are the goal, bake about 11 to 12 minutes until the outside edges are firm. Cookies will look underbaked. Remove from oven and let sit on the cookie sheet until cool. If crisper cookies are desired, bake until the tops are golden brown, 3 to 4 minutes longer, remove from oven and remove from cookie sheet as soon as cookies are cool enough to handle. If desired, dough may be portioned out and raw cookies refrigerated for at least two and up to 24 hours before baking. The cookies will be a bit thicker and will not spread quite as much. While this step is optional if using the dough right away, it is highly recommended if using refrigerated dough. Before baking, take your balls of dough, tear in half and put 1/2 on top of the other, with the “torn” edge facing upward. Gently reshape the bottom portion back into a round if it has become misshapen. This entry was posted in Click here for Fabulous Food Posts and tagged Chocolate, chocolate chip cookies, Chocolate Chips, Cookies, Desserts. Bookmark the permalink. Do you think you could freeze the scooped balls of dough? Would you then cook from frozen and add a minute or two, or let thaw first before baking? Hi Rose, they freeze great!! I cook them from frozen and do add a minute, then just check from there. 🙂 I hope you enjoy them!! They’re a great cookie. can you make these cookies using ounces ir grammes, rather than cups? I will NEVER use another chocolate chip cookie recipe ! These are AWESOME !! They were a hit with everyone, and I’ve got orders from headquarters for more ! Thank you so much for this recipe !! Hi Cindy, I’m so glad you guys like them and that they’re “headquarters” approved!! Thanks for checking back with me – your kind comment made my day!! Bet this was incredible! It looks so delicious. Thanks! They’re pretty special! I swear every time I’m goofing around with my blog and see this pic, I want one (or two) again!! We want one now!! Mmm!! I have to disagree with you. This cookie is every bit as pretty as a bakery cookie!! I’d take a dozen in a heart beat! Thanks Kris! They are very, very tender though, so they’d be hard to pack to give as gifts, for instance. I do think that’s just a bit of a drawback. But the taste is amazing! LAYERS!! And I bet your daughter has lots of winter stuff you could probably wear – ALL of us in the Midwest do, so you don’t have to pack/drag along/or wear everything you have! 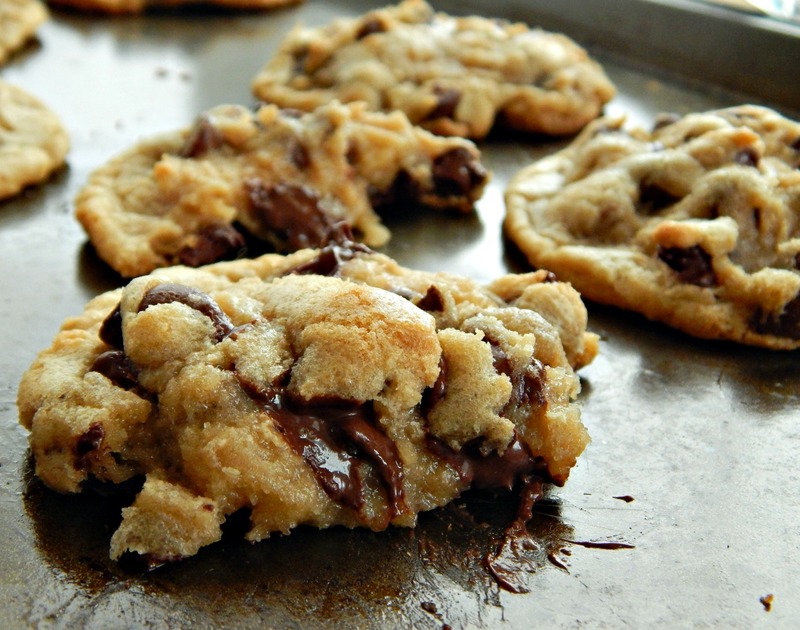 Oh my goodness, that photo of the melty chocolate in the cookie…gimme! Thanks! That was what I was hoping for, lol!! You made me long to bake these asap!! Nothing like the perfect chocolate chip cookie!! Well, I think they’re just a hair short of perfection because of the non-attractiveness factor, but that just means I’m going to have to go through all my chocolate chip cookie recipes and try them all again. A tough job, lol!! Thanks, they’re delish (and ooey). Hi, Lina – sorry for the late reply, but yes, you’ll NEED milk, lol!! Thanks, Ronit! They’re a fave, here! mmm. . . these cookies look wonderful. Nothing beats an ooey gooey full of chocolate chip cookie. Mmmm, now I want to hurry up and bake a batch!! I know, right! Hope you like them! Chocolate chip cookies are a weakness of mine. These look amazing Mollie! That would happen to me too 😉 They look sooo good! I LOVE choc chip cookies so much that I can’t be trusted with them. These look great! Thanks! I love these and ate way, way too many! Thanks, Bernadine, me too! I just don’t make them enough! I’ll have one with a tall, cold glass of milk please! You gotta’ have milk with these. They look delicious Mollie! Thanks much, and yes, milk! They say that there’s a scientific reason we like milk with chocolate chip cookies – the protein in the milk helps balance out the sugar in our systems. Me, I just think it tastes good, lol! Another one to try in my endless search for the perfect chocolate chip cookie. Thanks. I’d go for taste over looks any day.